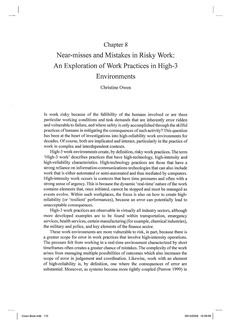 Risky Work Environments provides new insights into the multiple and dynamic trajectories of both near misses and mistakes in complex work environments, based on actual case examples. It also studies the interactions between various activity systems or work practices (design, maintenance, incident investigation, regulation, operation) and their consequences for operational performance. The role of rules and regulations is explored, considering the consequences of deviations and the limitations of enforced compliance. Furthermore, the book explains how to search for, think about and act on information about vulnerability, near misses and mistakes in a way that emphasizes accountability so as not to be punitive but instead responsible, innovative and provide opportunities for learning.